The most widely used comprehensive assessment test-the Woodcock-Johnson-has been newly separated into two distinct tests: Achievement and Cognitive Abilities. The WJ III(TM) Tests of Achievement include reading, mathematics, written language, and knowledge tests. To use these tests properly, professionals need an authoritative source of advice and guidance on how to administer, score, and interpret them. Cowritten by the creator of the Woodcock-Johnson and a coauthor of the WJ III(TM) Tests of Achievement, Essentials of WJ III(TM) Tests of Achievement Assessment is that source. 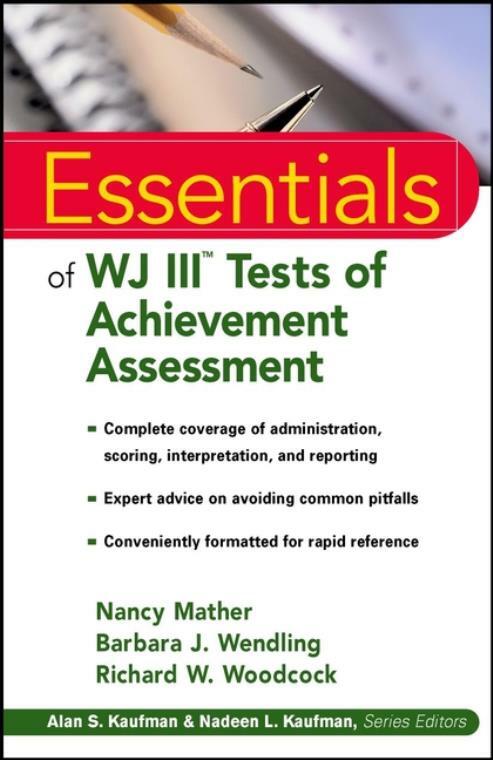 Essentials of WJ III(TM) Tests of Achievement Assessment is the only book to provide state-of-the-art guidelines to the Achievement portion of the WJ III(TM), with comprehensive instruction on test administration, scoring, and interpretation. The authors also offer expert assessment of the tests' relative strengths and weaknesses, valuable advice on their clinical applications, and several illuminating case studies. This book complements Essentials of WJ III(TM) Cognitive Abilities Assessment (Wiley), also cowritten by Dr. Woodcock. Two. How to Administer the WJ III ACH. Three. How to Score the WJ III ACH. Four. How to Interpret the WJ III ACH. Five. Strengths & Weaknesses of the WJ III ACH. Six. Clinical Applications of the WJ III ACH. NANCY MATHER, PhD, University of Arizona, College of Education, Dept. of Special Education and Rehabilitation, Tucson, Arizona.. BARBARA J. WENDLING, MA, BJ Consulting, Dallas, Texas.. RICHARD W. WOODCOCK, EdD, Measurement/Learning/Consultants, Ramona, California.